Dover Corn Products Ltd has brought one of Canada's oldest and most stable industries back to Chatham Kent, ON; Dry corn milling. Dover Corn Products is the ONLY dry corn mill in Ontario and we offer exceptional value, quality and service to all of our customers. We start with the raw corn kernel and produce from it, the highest quality cornmeal and flour for the food industry. Our customers depend on us to deliver ingredients they need to bring their products to market. We will work one on one with our customers and ensure that our products are delivered when our customers needs them. 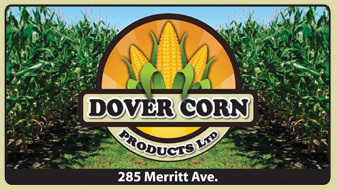 Dover Corn Products Ltd. uses only premium ingredients for all of our products and blends. We work very closely with our local growers to ensure that quality, repeatability and flavour are maintained in our finished products at all times. A variety of our employees favourite recipes using our cornmeal products. From Gluten Free Plain Flour to Spicy Oven Chicken, there is a recipe that you are sure to try out and enjoy! © 2012 Dover Corn Products Ltd.